Apparatus and method for scheduling the storage backup of data sets in either an application or system-managed storage context using an algorithm in which less data and a smaller backup interval (window) are involved other than that used with prior art FULL, INCREMENTAL, or COMBINATION backup policies. The invention is premised on an INCREMENTAL backup policy sensitive to a pair of adjustable parameters relating to the last backup, last update, and current date affecting each data set and its storage group. This invention relates to maintaining the continued availability of data sets in computer systems and, more particularly, to backup and recovery apparatus for scheduling the backup and recovery of data sets. A data processing system must be prepared to recover not only from corruptions of stored data such as those due to noise bursts, software bugs, media defects, and write path errors, but also from global events such as CPU power failures. The most common technique to ensure continued availability of data is to make one or more copies of CPU data sets and put them in a safe place. This process is called "backup" and occurs within contexts of storage systems of increasing function. The following paragraphs briefly describe the contemporary storflge environment and a current summary of backup policies and their limitations. Modern data processing machines comprise an instruction processor coupled to a hierarchically organized and least recently used (LRU) managed, staged storage system containing software and data. The fastest, most rapidly accessed storage is positioned closest to the instruction processor. Also, it is placed at the top of the hierarchy. Progressively slower forms of storage, which have the bulk of the information written thereon, occupy the lower positions within the hierarchy. Because storage costs increase dramatically with speed, many computer systems divide the physical storage subsystem into a number of performance levels. Some of these levels, such as DASD and tape, have been treated as peripheral I/O devices and are accessed over an asynchronous path. Other levels, such as RAM and cache, have been treated directly by system hardware and accessed over a synchronous path as part of internal storage. The term "internal storage" specifies that portion of storage randomly addressable for single read or write transfers. In IBM systems, internal storage is byte addressable except for an extension ("expanded storage"). Expanded store is randomly accessed on a block or page addressable (4096 bytes/block) basis. It is managed as an LRU real memory backed paging store. Lastly, "external storage" refers to that bulk portion of storage that is not randomly addressable and must be directly assessed, as on DASD. The internal store is deemed "synchronous" when a processor referencing said internal store will idle until a return is received; whereas, if the data being sought resides in external store (beyond a point called the "I/O boundary"), a referencing processor will search for another task to perform instead of waiting. The task or process switching is disruptive in that a retrieval path must be established to the new data and the processing state of the prior task must be saved. When the retrieval from external storage has been completed, it is again necessary to switch the CPU back to the former process or task. System-managed storage (SMS) refers to those CPU and operating system services, such as the IBM Data Facility Storage Management Subsystem, wherein the system automatically allocates data to various storage elements. The data is assigned according to its importance and frequency of use. The concept calls for placing data by priority with the most important data residing closest to the CPU in expanded storage or cache, while the least important data can be stored out on a direct access storage device. SMS-based systems include a logical data manager (LDM) and an external storage manager (ESM). ESM subsumes the externalized functions associated with space, performance, and availability management of physical storage; that is, storage beyond the I/O boundary. The LDM isolates the access methods and data set management functions from the ESM and is the focus for the logical view of data set format and content, record management, etc. It also provides the storage administration functions of defining and maintaining the logical views of storage, status, allocation and recovery of space, and maintenance scheduling such as backup. Backup policies are policies of scheduling. They have a time and a space dimension; that is, what should be the frequency of backup and over what range of data sets. As suggested above, the most common technique used to ensure the continued availability of data (data sets) is to perform periodic backups. Even periodic backups may not he sufficient, however, because all updates to a data set since the last backup may be lost. Periodic backup suffers from the defect that as a process it is itself executed in batch mode. Batch mode monopolizes a CPU, especially where FULL backup occurs. This is partially remedied by INCREMENTAL backup of only those data sets changed since the last backup. A third policy is scheduling a mix of FULL and INCREMENTAL backup. Another technique is to write all transactions to a log on a write-ahead data set basis. This is described in Gawlick et al., U.S. Patent 4,507,751, "Method and Apparatus for Logging Journal Data Using a Log Write Ahead Data Set", issued March 26, 1985. In this patent, a unit of work is first recorded on the backup medium (log) and is then written to its external storage address. Unfortunately, the Gawlick system is described with reference to data base management rather than storage management, and incorporates continuous logging to support rollback of incomplete transactions and forward recovery of those transactions completed since the last checkpoint of transactions in flight. Such intense levels of backup as transaction logging are easier to implement in interactive systems where human response times are long relative to transaction processing. Under that relative time ratio, it is possible to maintain the backup in the same state of consistency as the CPU external store in near real time. It is not feasible, however, where the CPU and external store operate largely in the batch mode. Where a storage manager or SMS implements only an INCREMENTAL policy, recovering the contents of a single DASD volume may require restoring data from a large number of backup DASD volumes as a function of the spread of DASD and the time at which the changed data sets were backed up. A FULL backup policy suffers the obvious disadvantage of long-time occupancy of the system, while a MIXED policy still results in a spreadout of the backup volumes and more time than an INCREMENTAL policy alone would take. It is an object of this invention to devise a method for scheduling the storage backup of data sets in which less data and a smaller backup interval (window) are involved other than that used with prior art FULL, INCREMENTAL, or MIXED backup policies. and means for recopying the copied data sets into the first non-votalile storage portion from the second non-volatile storage portion. It is an advantage of the invention that such method is operable either within the context of application-managed storage or SMS. (b) during a recovery cycle, recopying into the storage portion of the CPU from said other portions of nonvolatile store said backed up data sets and groups. Fig. 1 compares the percentage of backup reduction versus the percentage of data changed daily by use of inventive method relative to FULL/INCREMENTAL backup policy. Fig. 2 depicts the percentage of data backed up daily versus the backup interval. The invention can be conveniently practiced in a general purpose computer such as an IBM/360 or 370 architected CPU having the IBM MVS operating system. An IBM/360 architected CPU is fully described in Amdahl et al., U.S. Patent 3,400,371, "Data Processing System", issued September 3, 1968. An MVS operating system (OS) is set out in IBM publication GC28-1150, "MVS/Extended Architecture System Programming Library: System Macros and Facilities", Vol. 1. Details of standard MVS or other operating system services such as lock management, subsystem invocation by interrupt or monitor, and the posting and waiting of tasks is omitted. These OS services are believed well appreciated by those skilled in the art. If storage is system managed in the manner described by J. P. Gelb, "System-managed Storage", IBM Systems Journal, Vol. 28, No. 1, copyright 1989, at pages 77-103 and especially at pages 90-99, then the storage constructs and organization would differ from that found in an application-provided organization of storage. That is, Gelb posits a STORAGE GROUP as a dynamic pool of external storage volumes as the primary system-manipulable storage element. Other constructs include STORAGE CLASS, MANAGEMENT CLASS, and DATASETS. These constructs respectively represent a desired level of storage service (access, availability); policies controlling data migration, retention, and backup; and the primary application-referenced data/storage elements. In contrast to the system-controlled service and policy enforcement of storage allocation and scheduling, applications including high-level language (HLL) systems such as PASCAL, COBOL, FORTRAN, and APL come replete with their own file management systems. It is well within the state of the art to devise a monitor-initiated storage backup utility incorporating the method of the invention. Such utility can be written in any of the HLLs and include the HLL logical view of storage. 1.a A storage group is a set of storage volumes which contain data objects. A data object is always fully contained in a storage group. 1.b GBF(i) represents the Guaranteed Backup Frequency for storage_group(i). GBF(i) may be assigned different values for different i's. The integer value is specified by the Storage Administrator or is extrinsically supplied through a computer interface or through a defaulting rule. 1.c A data object is a collection of data for which a backup copy is created as a unit and the last_change_date and last_backup_date are tracked. A data object is always fully contained in a storage group. 1.d MBF(j) represents the Minimum Backup Frequency for data_object(j). MBF(j) may be assigned different values for different j's. The integer value is specified by the Storage Administrator or programmer through a computer interface or through a defaulting rule. 2.a Perform Steps 2.b - 2.n for each storage group in the computer installation. 2.b Perform Steps 2.c - 2.n for each data object in the storage group. 2.d "Last_change_date(j)" and "last_backup_date(j)" represent the dates of last change and last backup, respectively, for data_object(j). Last_change_date(j) is updated whenever data_object(j) is changed. Last_backup_date(j) is updated whenever data_object(j) is backed up. The last_change_date and last_backup-date may actually be tracked at a finer time unit than days; for example, hours, minutes, or seconds. With a finer time unit, unnecessary backup may be avoided in the case where a data object is backed up shortly after the data object is changed. The test condition on line 2.d is for data objects that have changed since last backup. An alternative to using the last_change_time(j) is to use a change_indicator(j), which is set ON whenever data_object(j) is changed and is set OFF whenever data_object(j) is backed up. If this alternative is used, the test condition on line 2.d will be changed to "IF change_indicator(j) is ON and". 2.e The test condition on line 2.e is to ensure that the time difference between two consecutive backups for data_object(j) is at least MBF(j). The Minimum Backup Frequency for a data object is a parameter that the Storage Administrator or programmer can use to control the backup policy for a data object so that the data object may be backed up less frequently than it is changed, if desired. 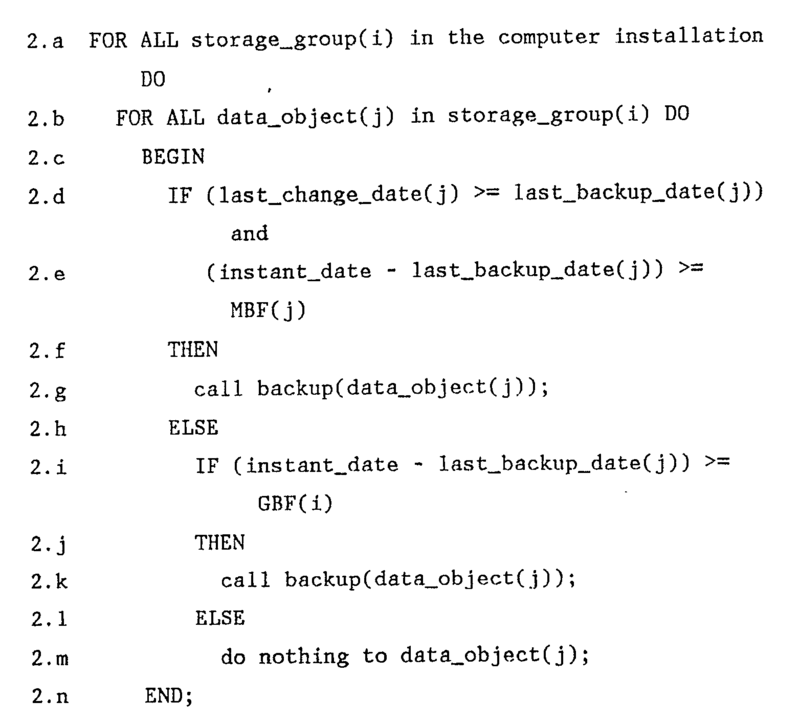 2.g "Call backup(data_object(j))" represents the process of making a backup copy of data_object(j) to nonvolatile storage, such as a magnetic tape. After the backup is done for data_object(j), the last_backup_date for data_object(j) is set to the current date, i.e., last_backup_date(j) := instant_date. 2.i The test on line 2.i is to ensure that the time difference between two consecutive backups for data_object(j) in storage_group(i) is at most GBF(i). The Guaranteed Backup Frequency is a parameter that the Storage Administrator can use to control the backup policy so that the data objects in a storage group may be backed up more frequently than they are changed. The purpose of Guaranteed Backup Frequency is the minimization of tape mounts for a future volume recovery. This method ensures that backup tapes from at most GBF(i) days are required to recover a volume in storage_group(i). 2.m If data_object(j) failed the tests on 2.d, 2.e, and 2.i, no backup should be made for data_object(j) during this backup cycle. F = the total amount of backup data created during the time period P using the mixed FULL and INCREMENTAL backup policy. For instance, where P = a 7-day backup cycle, the method of the invention creates approximately 19 percent less backup data than that produced by the mixed policy when 20 percent of the data sets are changed daily. Where P = a 30-day cycle, the method of the invention produces approximately 22 percent less backup data than the mixed policy when 5 percent of the data sets are changed daily. C = the percentage of total data changed daily and randomly distributed. 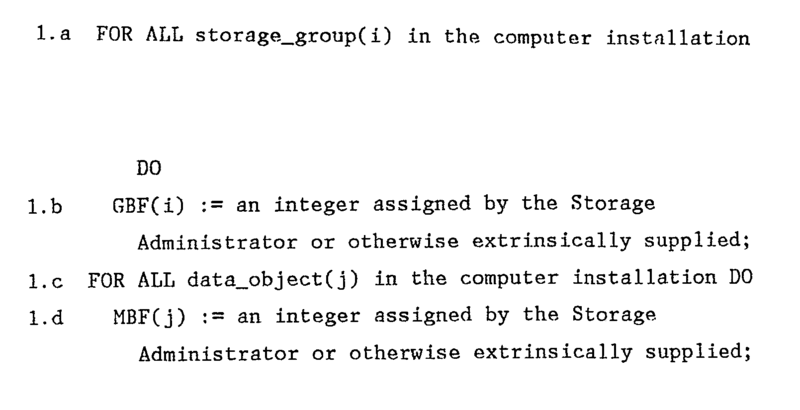 Assume that data_objects a, b, c, and d reside in storage_group(x). The current date is 07/17/89. In Step 1.b, GBF(x) is set to a value of 7. In Step 1.d, MBF(a-d) are set to 2, 3, 1, 1, respectively. Furthermore, assume that data_object(a) and data_object(b) were both last backed up on 07/15/89 and last changed on 07/16/89. Data_object(c) and data_object(d) were last backed up on 07/10/89 and 07/13/89, respectively. Both data_object(c) and data_object(d) were last changed on 07/01/89. The following describes the backup processing for data_objects a, b, c, and d in this example. Since the conditions in steps 2.d and 2.e are both true, step 2.g is executed and data_object(a) is backed up. After the backup, last_backup_date(a) is set to 07/17/89. In this case data_object(a) is backed up because it was changed since the last backup and the last backup is already 2 days old; thus, it satisfies the minimum backup frequency for data_object(a). Since the condition in step 2.e is false, step 2.g is not executed. Since the condition in step 2.i is false, step 2.k is not executed. Therefore, data_object(b) is not backed up during this backup cycle. In this case, although data_object(b) was changed since the last backup, its last backup is 2 days old, which is less than MBF(b), and therefore no backup should be done. Since the condition in step 2.d is false, step 2.g is not executed. Since the condition in step 2.i is true, step 2.k is executed and data_object(c) is backed up in this backup cycle. After data_object(c) is backed up, last_backup_date(c) is set to 07/17/89. In this case, although data_object(c) has not been changed since it was backed up on 07/10/89, the time since the last backup has elapsed of 7 days, which is equal to GBF(x), indicates that data_object(c) needs to be backed up again. Since the condition in step 2.i is false, step 2.k is not executed, i.e., data_object(d) is not backed up during this backup cycle. In this case, data_object(d) has not been changed since it was last backed up on 07/13/89 and the time since its last backup is only 4 days, which is less than GBF(x); therefore, data_object(d) should not be backed up during this backup cycle. There has been described a CPU for backup copying of data sets residing in internal or external store using a modified INCREMENTAL backup policy where only new and changed data since the last backup will in turn be elsewhere copied. The invention is sensitive to a pair of adjustable parameters (MBF, GBF), where MBF is the minimum period between backups for a data set and GBF is the maximum period between backups of a data set in the larger storage group. (2) the difference between the instant date and the date of last backup equals or exceeds the GBF. The parameters GBF and MBF may be either empirically or analytically derived. They are either supplied by the application or the storage administrator portion of SMS. Based upon this critical observation, the method is the essence of simplicity; namely, (a) during a backup cycle, ascertaining the eligible data sets by evaluating the date of last change and the date of last backup such that a data set is included if it satisfies condition (1) or (2) above; and (b) elsewhere copying the ascertained subset to nonvolatile storage. Advantageously, when a system using the backup method according to the invention operates in a RECOVERY mode, it need use only those backup volumes no older than the GBF date. Various changes and additions can be made to this invention without departing from its scope as defined in the claims. Backup and recovery apparatus as claimed in Claim 1. (b) elsewhere copying the ascertained subset to nonvolatile storage. 5. A method as claimed in claim 4, wherein said INCREMENTAL policy being in contradistinction to either FULL VOLUME backup where all data whether or not changed since the last backup will in turn be elsewhere copied, or COMBINATION backup where FULL VOLUME backup is periodically invoked and INCREMENTAL backup invoked therebetween. 6. A method as claimed in claim 4, wherein MBF is the minimum backup interval for said data sets, and GBF is the backup interval for the cognizant storage group.